It was a couple hours after my second piece of red velvet cake at a friend’s birthday dinner that I started to feel guilty. I had started the day with an invigorating rooftop yoga class and slowly throughout the day cancelled out the benefits of my morning fitness session simply by making stupid food choices. Pregnant or not, one piece of cake is totally fulfilling and sufficient. Post-birthday dinner I vowed to start over on Sunday and start the day with a ride. I could easily stay on the complaint bandwagon I feel like I’ve been on for the last few weeks. I have definitely been in the mental slumps ever since I had to admit that my pregnant running days were over. I have let myself feel sorry for myself; I have wallowed in self-pity about not running; and I have definitely spent a lot of time being paranoid and thinking and re-thinking about low long it will take me to bounce (i.e., slowly crawl, walk, run) back into running after delivery. I’ve spent so much time focusing on not running that I have forgotten to focus on what I can do and can control. And so after I dealt with the regret of that second piece of cake, I decided it’s time–for real this time–to make a change. I have 8 weeks left to make smarter choices, to continue to stay active and fit and most importantly, to stay positive and focus on what I can do, one day at a time. There are certain movements, namely running and even power walking (and also volleyball which I learned the hard way), that really exacerbate the pain in my pelvis. However, there are plenty of things that don’t. What I can do comfortably and without causing pain (discomfort maybe but not pain) include spin class, cycling, yoga, swimming laps (freestyle only), rowing and various weight routines. Of these, spin class is still the best cardio work-out and also the most comfortable as I have easier control over the seat and handlebar heights and distance. 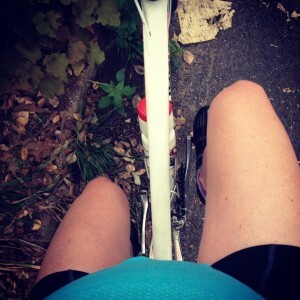 Road biking does not cause pelvis pain but the original position of my seat and handlebars is somewhat of a challenge with my 8-month belly in the way…still totally worth doing. Yoga is great. 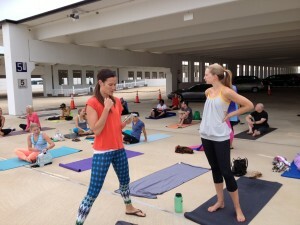 It’s a whole different kind of work-out and one I need to keep up with for the strength and flexibility it offers. I just need to make an effort. Swimming I am trying to rediscover. I’ve only been a few times and to make it to the pool at the crack of dawn requires the same discipline as any early morning training run or work-out. I haven’t done laps in so long that 25 minutes or so gets my heart rate up and is a rewarding enough work-out, but it also makes me realize I shouldn’t have ever stopped. I also recently tried the rowing machine again in our basement and was pleasantly surprised that it wasn’t as hard as I thought it’d be. I thought for sure my belly would prohibit me from rowing but it is definitely doable. And of course, squats and any combination of arm routines with weights are perfectly fine to do and I never should have slacked off on these exercises. I thought about all these things while I was on my slow and steady Sunday ride. I averaged about 14 mph over 12.5 miles…I didn’t even hit the max “allowed” trail speed of 15 mph. But speed right now is not the point. Consistency is the point. A positive attitude is the point. 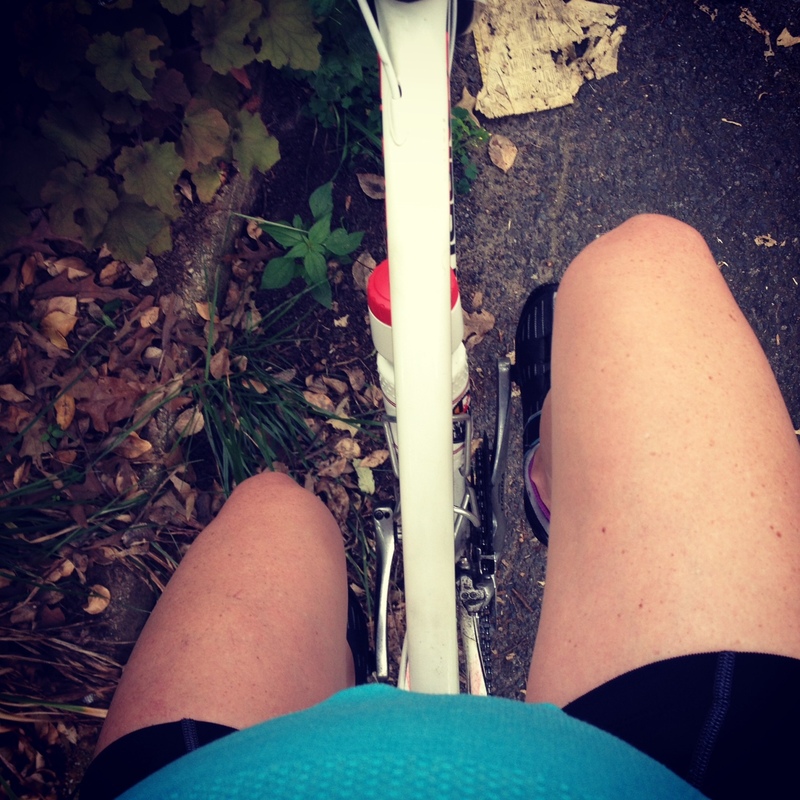 Sticking with a routine, committing to getting up, focusing on the work-outs I can do (and actually doing them), keeping myself active and fit for the next 8 weeks of pregnancy until I can start new routines and a “new normal”–these things are the point. Not being able to run right now cannot be the end of my world. I’m lucky that I can still do all these other things. And that second piece of cake? Well, that’s just mind over matter.